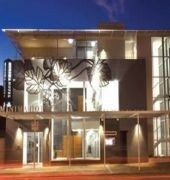 The Majestic Minima Hotel in North Adelaide is Adelaide's first 24 hour self check-in hotel. The three-storey boutique property - with 46 compact mini studio rooms measuring approximately 14 dquare metres - is setting out to prove that size doesn't matter. Featuring king size beds, LCD televisions with cable TV, broadband internet and more. The Majestic Minima Hotel has set new trends in Adelaide and provides a hip alternative for the technologically savvy and budget conscious traveller.